Commercial Door Frames for Hollow Metal and Wood Doors. 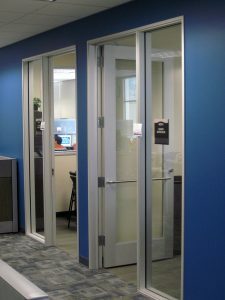 Maybe you already have your doors, but now need Commercial Door Frames? We offer knock down and welded door frames in many different sizes. We are also proud to offer Timely Frames, pre-finished steel commercial door frames. With Timely’s Total Opening Concept, an installer can install the pre-finished frame, door and hardware at one time. This results in substantial savings over other products that require return visits for hanging of doors and hardware, plus field painting costs. Tell us about your project, and get a quote! To order all other frames, please visit our Quote Builder. Salco Specialities also offers repair and rework of your existing commercial door frames and doors. Give us a call today or use our form here. Need a custom install? We can handle jobs both big and small! We work with generals, subs, or directly with owners who need assistance with the installation of commercial hollow metal doors and wood doors, as well as a variety of other services.